Little accidents like spilling a glass of water or dropping a pile of alphabetized papers can be quite the nuisance. But what if you drop your iPad? That'd be one expensive mistake! If you carry your iPad or other tablet around campus, even if you have a case for it, accidents are bound to happen. That tablet is too expensive to treat without the utmost care. 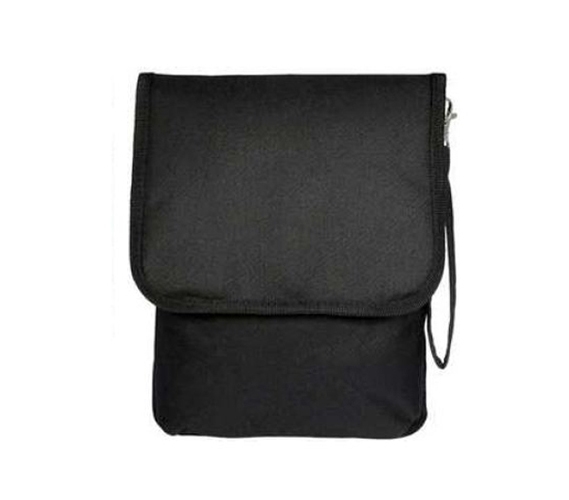 So when you're walking around campus, keep your tablet in this Bold Black iPad Bag. With its padded interior, your device will be world's safer than if it were just being carried by your clumsy hands! By always remembering to keep your iPad in this carrier bag, you'll be in the habit of not leaving it sitting on a desk, coffee-shop table, or the hundreds of other places you could set and leave your iPad. A stolen tablet is just as bad as broken tablet, so keep that device well-guarded. While you might be thinking you'll keep your tablet in your college backpack, a backpack can't provide as ideal storage. After all, textbooks and other items could jostle around that iPad, and that expensive tablet deserves the best treatment! For carrying it around, you'll find no better means than this Bold Black iPad Bag.